James Memorial Higher Secondary School is a boarding academy located in Tamil Nadu state in southern India. Established in 1941. The school includes classes for kindergarten through twelfth grade. Enrollment is 936, including 243 who live in dormitories. While 80 percent of the students come from Adventist families, a baptismal class is held every Sabbath and is open to students of all faith. Between 50 and 60 students are baptized every year. Even more students wish to attend James Memorial Higher Secondary School, but the dormitories can’t accommodate more students. A new girls’ dormitory will be built with help from this quarter’s Thirteenth Sabbath Offering. To Sabbath School teachers: This story is for Sabbath, Sept. 2. Click here for photos to share while telling the mission story. His mother committed suicide, and his family disowned him. But Ranjith still has the hope that was born from advice that he received when he was a boy. Ranjith [pronounced: rahn-JEEth] who grew up in a poor family and often went hungry. But he says the advice came from the Seventh-day Adventist owner of the house that his parents rented saved his life. The man cared for Ranjith and even enrolled Ranjith in an Adventist school and paid for his education. But when Ranjith was in the fifth grade, the landlord moved to another country, and Ranjith had to enroll in a public school. Then Ranjith learned that he would be allowed to return to the Adventist school on a scholarship provided by Adventist Child India, a nonprofit organization founded to cover tuition and boarding costs of deserving schoolchildren in India. 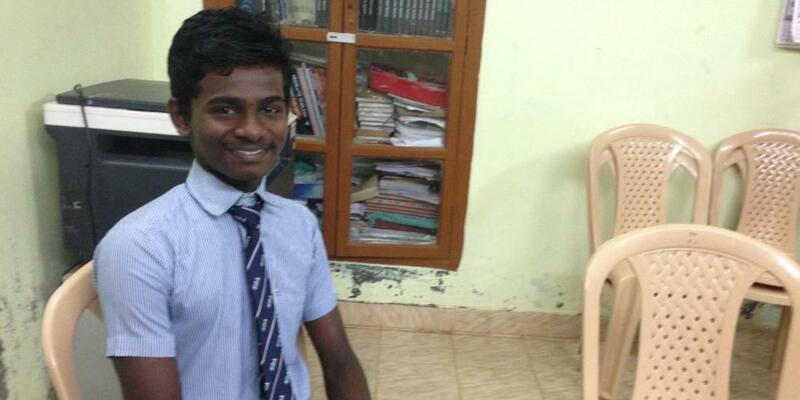 Ranjith said he owes his life to people who have sponsored his Adventist education. During his seventh-grade year, Ranjith moved into the boys’ dormitory at James Memorial Higher Secondary School in southern India. It was then that he began to follow his former landlord’s advice to pray and study the Bible. He also started to attend church services regularly. He said the school became a haven away from his home, where his parents quarreled frequently. “I felt my life was safe here,” he explained. Tragedy struck when Ranjith was in the eighth grade. His parents were arguing, and his mother set herself on fire. She died of her injuries. As he mourned his mother’s death, he resolved to serve Jesus faithfully. He volunteered for various duties at the school’s church, including being responsible for the keys. But as Ranjith embraced his new faith, his family disowned him. The difficulties intensified when his father remarried and his new wife refused to accept Ranjith. During this time, he struggled to focus on his studies, and his grades dropped. He made new friends who had a negative influence on him. He considered rejecting Jesus. But then he attended a week of prayer at his school and told his story to the week of prayer speaker, an Adventist pastor. “He prayed for me, and I prayed about all my needs and sufferings,” Ranjith said. Ranjith’s faith returned. Today Ranjith is 17 years old and in the 11th grade. He prays daily, reads the Bible, and is seeking Jesus’ will as he prepares for baptism. James Memorial Higher Secondary School is a home and haven as well as a school to hundreds of students. Over the years, thousands of young people have studied here and learned who Jesus is and how much He loves them. Lives have been changed by this school and hundreds of others throughout India. Part of this quarter’s Thirteenth Sabbath Offering will help build a new girls’ dormitory at James Memorial Higher Secondary School. The current girls’ dormitory is 65 years old and has only five toilets and five showers for about 100 girls. The new dormitory will accommodate more students and provide a healthier environment in which to live and study. Please remember this school in your prayers and with your Sabbath School mission offerings.